JOIN US Anytime of Year! Safaris are filled in deposit receipt order. Gorilla Permits are limted in number and are in high demand. Permits are not requested until deposits are received and are not guranteed until confirmed. All Profits benefit our wildlife conservation and education efforts! Your 10 Day Uganda Safari Includes 4 National Parks, Gorilla and Chimp Tracking, Game Drives, Boat & Foot Safaris, Cultural Experiences and More! Day 1: Welcome to Uganda! 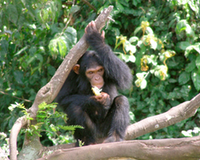 / Entebbe arrival, greeted by Wildlife Experience staff, transfer to Entebbe accommodations. Overnight stay in Entebbe. Day 2: Mabamba Wetlands Lake Victoria / Enjoy a Sunrise Boat trip across lake Victoria before canoeing through the thick papyrus reeds in the Mabamba Wetlands in search of the endangered Shoebill Stork (pictured right). Listen to the cadance of the African Fish Eagle while on the lookout for over 120 species of birds including the Africa Jacana. Overnight in Entebbe. Day 3: Kibale Forest National Park / Bigodi Wetlands Early departure west to Ft. Portal, situated in the northern foothills of the Rwenzori Mountains, the Mountains of the Moon, lush with tea plantations and crater lakes. African buffet lunch in Ft. Portal, then into Kibale for afternoon nature walk at the Bigodi Wetland Sanctuary, overnight stay in Kibale. Day 4: Kibale Forest & Chimpanzee Tracking Early morning Chimp tracking in the Kibale rainforest, rich with an astonishing variety of primates (13 species), birds and butterflies (over 250 species). Enjoy an afternoon of relaxation in the beautiful Kibale area or meet the local community and participate in our Community Action Project, the choice is yours. Day 5: Queen Elizabeth National Park & Game Drive Leisurely drive to Queen Elizabeth NP. Afternoon game drive in search of Lions, Buffalo, Spotted Hyena, Elephant, Leopards, Giant Forest Hog, Kob, Bushbuck, Topi, Waterbuck and more. Over night stay QENP. 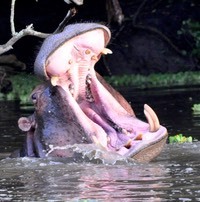 Day 6: Queen Elizabeth NP / Kazinga Channel Boat Trip Sunrise Game Drive, a bit of rest then afternoon boat cruise along the Kazinga Channel amongst the crocodiles, variety of bird life, large hippo pools and diversity of animals who come to quench their thirst in the afternoon heat. Overnight stay in QENP. Day 7: Queen Elizabeth National Park / Bwindi Early game drive en route to the southern section of the park in search of the tree climbing lions of Ishasha. Continue our southern route to Bwindi Impenetrable National Park. Overnight in Bwindi. 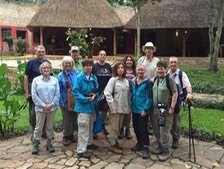 Day 9: Lake Mburo National Park / Early departure through the beautiful area of Kabale to Lake Mburo National Park. Afternoon game drive, viewing Zebra, Giraffe, Impala, Eland and other savanna species. Overnight LMNP. Day 10: Lake Mburo National Park to Entebbe / Begin our journey to Entebbe, stopping at the equator for photographs and souvenirs. Depending on your flight schedule, Airport transfer or dinner and overnight stay in Entebbe where you can reflect upon your incredible journey and begin to enjoy the lasting, if not life changing, memories of your safari. Overnight in Entebbe. Day 11: Breakfast and airport transfer. Check out time is 12:00 noon. EXCLUSIONS - International Airfare, Visas, beverages & meals not already mentioned in this itinerary, laundry services, personal items, tips & gratuities, travel insurance (recommended). 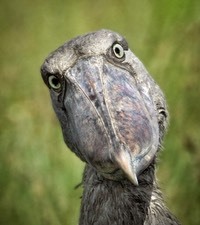 TRIP EXTENSIONS - There is much to see & do in Uganda and East Africa. We offer Trip Extensions to Murchison Falls National Park in Uganda, Masai Mara and 4 other parks in Kenya, 6 National Parks in Tanzania Including Serengeti and Ngorongoro Crater as well as Highlight areas in Rwanda. Trip extensions are arranged depending on your time, interests, health and budget and are highly recommended! W.E. will help you prepare for your journey every step of the way. Once deposits are received and permits are secured, you will receive an Information Packet with instructions & recommendations on Visas, Passports, Vaccinations, Currency, Country & Cultural Etiquette, Packing, our Terms and Conditions and much much more. Because most international flights arrive in Uganda in the late evening and we leave on safari very early the following morning, we recommend that you arrive a day early. Ask us for trip extensions and rates.